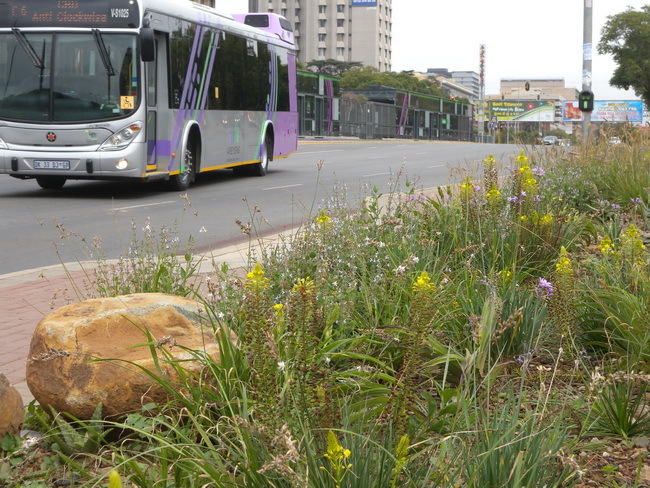 Landscape architect and lecturer, Dr. Ida Breed approached Wildflower Nursery to supply plants for the sidewalks on Nana Sita Street between Paul Kruger street and Nelson Mandela drive in Pretoria. The concept was new: Only use indigenous plants that will reflect the biodiversity of our region and to demonstrate that this concept can be applied to an urban environment. Aesthetics was also a driver, but not the main one. To quote Ida: “Generally, there are three main reasons why people value biodiversity. Biodiversity is most often equated to the benefits it provides mankind. Secondly, biodiversity allows ecological systems to function and for speciation to occur that prevents extinction Thirdly, biodiversity can be intrinsically valued for its own sake and independent of human benefits and needs” (Footprint Limited, March 2015). Obviously, the site could not accommodate all the aspects of biodiversity, but it remained the guideline. In the design approach, Ida focused on certain habitats such as mixed grassland (sun and shade) and dry grassland including succulents. Rocks were also incorporated to create microhabitats. The concept was not to plant mono stands, but to reflect the diversity of plants found in Nature. 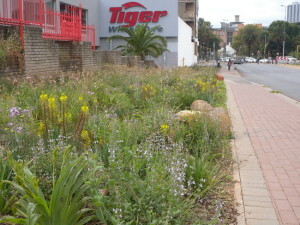 Focus on species from the grassland biome with emphasis on the vegetation units surrounding Pretoria. Plants should have low maintenance requirements. This only implied that no plants that are adapted to very specific microhabitats in nature should be used. Although grasses are dominant in terms of numbers in the grassland biome, they only represent 20% of the species richness. To make the site also attractive, it was decided to plant 40% grasses and 60% grassland species. A total number of 16 000 grassland plants, consisting of 60 species were planted in. Equally, the number of grasses totalled 7 000 consisting of 15 species. The average plant density used was 6/m2. The grasses were supplied by Ivan van der Walt from Diverse Ecological Solutions. The pictures below, courtesy Dario Schoulund, urban architect and lecturer. Although the initial planting did not look very impressive, the size and spread of the mature plants were taken into consideration when the plants were placed. The height of the plants, including the grasses, were also considered in the placement. The plants established fairly quickly and made a well-balanced impression, providing a very natural look. More rocks could have been placed to protect the plants from misuse. 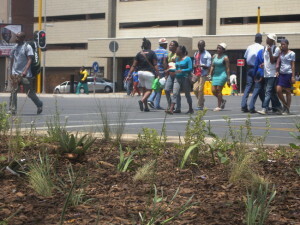 One of the aims was to make the plants also visible for, inter alia, the BRT passengers. The plants therefore had to have enough body to make an impression from a distance. From the picture it is evident that this goal was achieved. From this picture it is clear that the combination between structure and colour was also achieved, but with a natural “look and feel”. The mature density and height of the plants made it lush, but not overcrowded. There is no such thing as a “maintenance” free planting especially during the first year. In this project, the contractor was very negligent and I got the impression that they did not really understand the concept and consequences of this project. Make a site like this “people unfriendly”. Use large rocks to restrict access, especially for vehicles. Make sure that the plant mix also include some very thorny plants.